MANILA, Philippines – The San Miguel Beermen (SMB) sent the Rain Or Shine Elasto Painters (ROS) to a grand vacation after ending their Governor’s Cup campaign 117-110, on a rainy evening of Wednesday, July 08, 2015 at the Smart Araneta Coliseum. Junmar Fajardo bags 27 points against ROS "Extra Rice Boys"
Ailing “Extra Rice Inc. CEO” Beau Belga was really itching to comeback and help his team up whose one foot is already in the grave. “No need to worry, I got your back” said the “Extra Rice Other Half” JR Quinahan as he gave Coach Yeng Guiao back-to-back three-pointers and a two during the opening acts of game number 4. Jeff Chan paired Quinahan with his own version of two triples and a short jumper while Arizona Reid was doing the outside stuff for the San Miguel Beermen with couple of treys under 5 minutes of quarter number 1. Beau Belga finally made his first appearance after he injured his right ankle during game number 1 but admitted that he hasn’t fully recovered yet. Surprisingly, Painters’ scoring monster import, Wendell McKines has just tallied 1 point after the first quarter and the main reason why San Miguel was up by double digits, 31-20. Coach Guaio opted to sit his import for more than 7 minutes due to a bad start and Gabby Espinas capitalized on McKines’ absence by posting 3 for 3 field goal shooting. After Chan and Quinahan’s hot start, the Painters went silent. 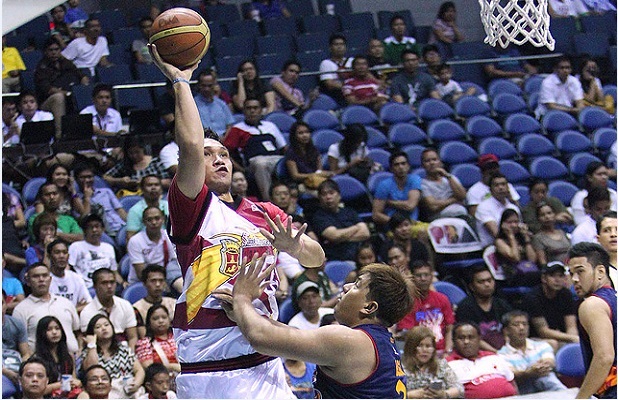 Paul Lee who came off the bench broke ROS’ deafening offensive tranquility by jotting 7 straight points. McKines finally found his rhythm right under the basket as he backed-up Paul Lee in trimming SMB’s lead to a single-digit 48-39 at the 4-minute mark of the second period. Junmar Fajardo who was playing well in the first quarter until midway of the 2nd, banged his right knee onto the stone-built JR Quinahan. Fajardo went down on the floor and was immediately attended by SMB medical staff. “The Kraken” was pulled out of the court to nurse his bruised right knee. Marcio Lassiter closed the first-half with a break-jump-trey with Gabe Norwood and Jeff Chan’s extended arms in front of him. The Beermen were up by 14, 64-50. Beermen fans got a sigh of relief after seeing Junmar Fajardo started the third quarter and made his 1st second-half basket coming from Arwind Santos. Rain Or Shine made a 10-4 scoring run courtesy of Coach Yeng Guiao’s “Super-Subs” Jireh Ibanes and Jericho Cruz that forced Coach Leao Austria to call a 30-second break. Silently, Beermen’s bigman Fajardo was doing a huge role in maintaining their double-digit lead and amazingly had a perfect field goal of 8 for 8 with more than 15 minutes remaining in the entire ball game. Both “Extra Rice Boys” got into foul trouble for guarding “The Kraken” underneath the basket that sent him nine times to the foul line. JR Quinahan was slapped with a flagrant foul 1 after extending his sharp elbow straight into Chris Ross’ chin off a pick. 36 minutes had gone by and San Miguel was still up by a good margin 93-74. Rain Or Shine had 12 more minutes to catch-up in order to force a rubber match on Friday. A door of hope slightly opened for the Painters as they stretched for a 9-0 run and cut the lead to just 10 points 93-83. Wendell McKines and Gabe Norwood combined efforts as they closed the gap to just 6 points 106-100 with 4 more minutes remaining on the game clock. Jeff Chan recorded his conference best of 21 points as he led his team in scoring at the 2-minute warning of the game and gave ROS the smallest deficit of 3 points. San Miguel learned their lesson from game number 2 for blowing out their 20-point lead and handing the win to Rain Or Shine, decided to use the clock wisely to protect their lead and seal the win that will bring them to the finals against the Alaska Aces. The Beermen marched onto the finals for the 35th time in their franchise history. The Alaska vs San Miguel Finals Showdown is set on Friday July 10, 2015 at 7pm.